MakeupbyEesha: Glamorous glittering bronze eyes and red lips look for an evening wedding party - A look from my recent vacation! 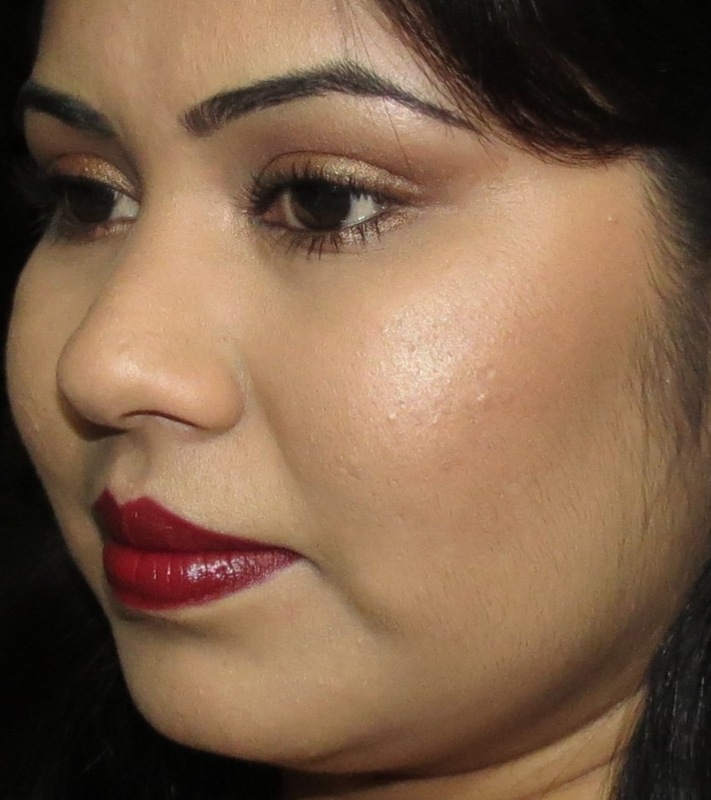 Glamorous glittering bronze eyes and red lips look for an evening wedding party - A look from my recent vacation! As promised, here is the first look from one of the looks I did during my recent vacation to a cousin's wedding. This look is very classy and glamorous and is a typical Indian Bridal kinds. Actually I did this look on my sister-in-law for the reception party followed by overnight wedding. She told me two requirements for her make-up: 1. glammed up but not over done at the same time and 2. wanted her make-up to last longer, through the overnight wedding, especially her lipstick. She wore an extremely pretty cream and red lehenga with gold embroidery. I feel this look complimented here dress. This look is very versatile and can be worn not just for a wedding party but for a night out with friends or a candle dinner with special someone. This look will steal the show for you! So, lets see how I created this look, with exact same products. Step 7: Apply MAC Bronze eyeshadow through the lower lash line till the outer half, then trace amber lights through the center of the lower lid and Vanila pigment through the inner third of the lower lash line. Also, apply Vanila pigment in the tear duct and blend it upwards towards the crease. Step 8: Apply Urban Decay Bourbon through the lower water line and Urban Decay Zero through the upper water line for creating a nice base for your lashes. Step 9: Apply MAC Pigment in Reflects Bronze on the center of the lid. I hope you all liked the look. I really liked the look on her than on me. She is really pretty. I am not sharing her pictures here due to privacy reasons. Hii Eesha! Love the makeup..especially the lip color - AWESOME. A quick glamorous look for a busy day!